A Kaleidoscope of Colors and Flavors! 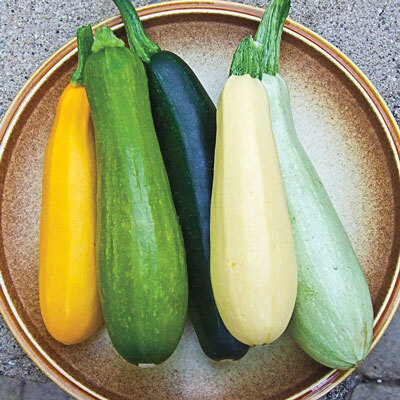 Variety abounds with this outstanding collection of squash in eye-catching shades of lime, butter, gold, gray and deep green. Plants have a spineless, open bush habit for easy picking, excellent disease resistance, and yields are simply phenomenal! 45 - 60 DAYS. Spacing: Direct sow is best, soil temperature should be 60 degrees F. When planting in hills, plant 6 - 8 seeds per hill, 3 - 4 feet between hills, thin to 2 - 3 plants per hill. Days To Maturity: 45 - 60 days. Fruit: Elongated fruits in various shades of yellow, grey and green. Yield: 300 fruits/100 foot row.